Under Nicholas I, uniforms and greatcoats were still made very narrow, especially in the cavalry, where officers even had to wear corsets; under the greatcoat, there was nothing to be poddit; The collars of the uniform, remaining all the same high, fastened tightly and strongly propped their heads; shako reached up to 5.5 heights of height and looked like turned upside down buckets; during the parades they were decorated with sultans in 11 vertices long, so that the entire headpiece was a height of 16.5 inches (about 73.3 cm). Sharovars, in the winter cloth, and in summer linen, were worn over the boots; under them were put on five, six buttons, as the boots were very short. Beginning in 1832, simplifications began in the form of uniforms, expressed primarily in the simplification of ammunition; in 1844 heavy and inconvenient shakas are replaced by high helmets with a sharp pommel (however, in the horse-grenadier and hussar regiments of the shako were preserved), officers and generals began to wear caps with visors instead of obsolete bunks; troops were equipped with mittens and headphones. Since 1832, officers of all weapons have been allowed to wear a mustache, and the officer's horses do not cut their tails and do not cut the reptiles. 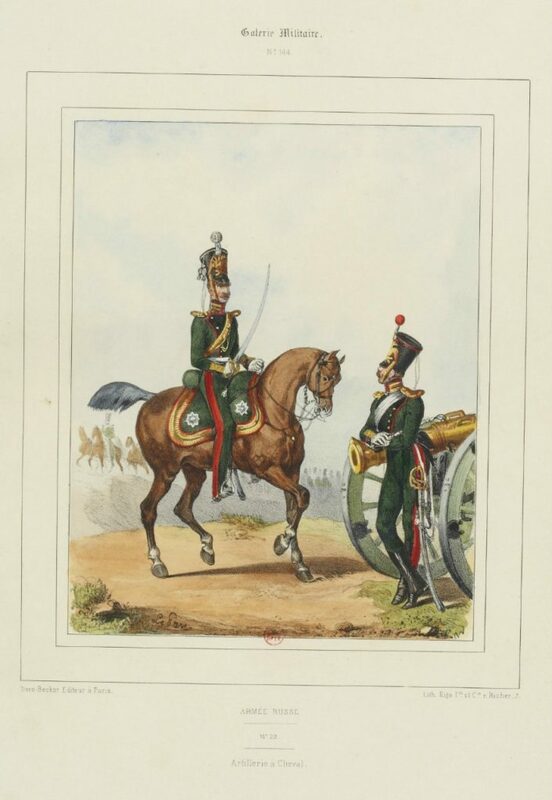 During the reign of Nicholas, the form instead of the French increasingly acquired Prussian cut: for officers and generals were introduced ceremonial helmets with ponytails, uniforms for guards were sewed from dark blue or black cloth, tails in army uniforms were made extremely short, and white trousers at ceremonial and solemn occasions, red stripes began to be worn, as in the Prussian army. In 1843, on the shoulder straps were introduced cross-stripes - skins, according to which the ranks differed. In 1854, epaulets were also introduced for officers: first only for wearing on a greatcoat, and since 1855 - and on a daily basis. From this time, a gradual decline of epaulets use began. При Николае I мундиры и шинели сначала делались по-прежнему весьма узкие, особенно в кавалерии, где офицерам приходилось даже носить корсеты; под шинели нельзя было ничего поддеть; воротники мундира, оставаясь всё такими же высокими, застёгивались наглухо и сильно подпирали голову; кивера доходили до 5,5 вершков высоты и были похожи на перевёрнутые вверх дном вёдра; во время парадов они украшались султанами в 11 вершков длиной, так что весь головной убор был высотой 16,5 вершков (ок. 73,3 см). Шаровары, зимой суконные, а летом полотняные, носились поверх сапог; под ними надевались штиблеты на пяти, шести пуговицах, так как сапоги были совсем короткие. С 1832 г. начинаются упрощения в форме обмундирования, выразившиеся прежде всего в упрощении амуниции; в 1844 году тяжёлые и неудобные кивера заменяются высокими касками с острым навершием (однако в конно-гренадёрских и гусарских полках кивера были сохранены), офицеры и генералы вместо устаревших двууголок стали носить фуражки с козырьками; войска были снабжены рукавицами и наушниками. С 1832 г. офицерам всех родов оружия разрешено носить усы, а офицерским лошадям не подстригать хвостов и не подрезать репицы. За годы правления Николая форма вместо французского всё больше приобретала прусский покрой: для офицеров и генералов были введены парадные каски с конскими хвостами, мундиры для гвардии шились из тёмно-синего или чёрного сукна, фалды на армейских мундирах стали делать крайне короткими, а на белые брюки при парадных и торжественных случаях стали нашивать красные лампасы, как в прусской армии. В 1843 г. на солдатских погонах были введены поперечные нашивки — лычки, по которым различались звания. В 1854 г. погоны были введены также и для офицеров: сперва лишь для ношения на шинели, а с 1855 г. — и на повседневной форме. С этого времени началось постепенное вытеснение эполет погонами. Mahometan regiment. The military uniform of the Russian army in 1852. The military uniform of the Russian army in 1852. Военная форма русской армии образца 1852 года. The military uniform of the Russian army in 1852. Cuirassiers of guard. The military uniform of the Russian army in 1852. The military uniform of the Russian army in 1852. Drummers. Cossacks. The military uniform of the Russian army in 1852. Don Cossacks. The military uniform of the Russian army in 1852. Prussian grenadiers. The military uniform of the Russian army in 1852. Riga Dragoons. The military uniform of the Russian army in 1852. Novgorod dragoons. The military uniform of the Russian army in 1852. Horse Guards. The military uniform of the Russian army in 1852. Dragoon officer. The military uniform of the Russian army in 1852. The military uniform of the Russian army in 1852. Palace guards grenadiers. Support officer. The military uniform of the Russian army in 1852. The military uniform of the Russian army in 1852. Grenadiers. Hussar officer. The military uniform of the Russian army in 1852. Malorossia Cossacks. The military uniform of the Russian army in 1852. Izmailovskiy guards. The military uniform of the Russian army in 1852. Cavaliers. The military uniform of the Russian army in 1852. The military uniform of the Russian army in 1852. Cavalry Guards. The military uniform of the Russian army in 1852. Cossack.